Ahoy mates, as Virgin Voyages would say. I’ve always been a fan of Sir Richard Branson and his Virgin brands, so when I heard that he was going to start his own cruise line, I was excited. And now that I’ve read and seen more about the cruise line and ship, I’m even more excited. Virgin has more than 60 companies worldwide, employing 71,000 people in 35 countries, starting with Virgin Records in London in the 1970’s. As for Sir Richard, on top of being an entrepreneur and an author, he loves adventures. He loves hot air balloons, and even plans on joining his family on the first space flight of his Spaceliner from his company Virgin Galactic when it’s ready to fly. Additionally, he supports women in leading rolls in his companies. Sounds like such an interesting, fun, and altogether nice man! 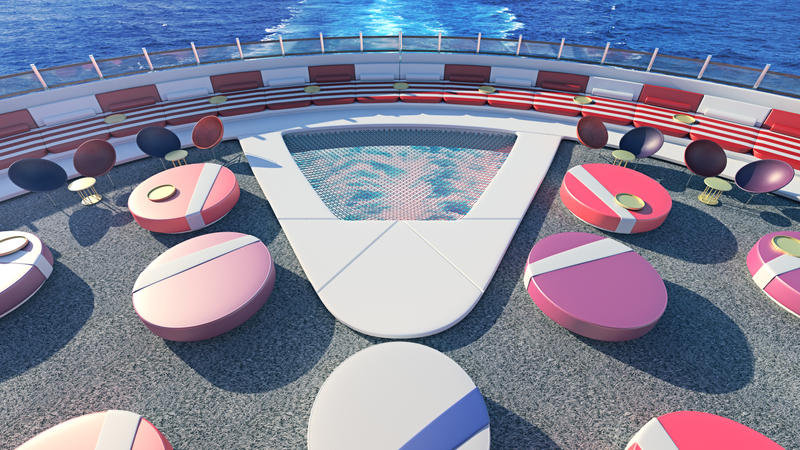 First off, the Scarlet Lady, the name of Virgin Voyages’ first ship, will be an adults only ship, 18+. This sounds like the perfect cruise for The Quiet Cruiser, doesn’t it? If you love to bring your kids cruising, this won’t be the cruise for you. But if you want to get away from them once in a while for a peaceful couples’ vacation, this will be perfect. I love kids, but to go on a cruise with no strollers running into you, no kids running up and down the hallways knocking on doors, and no kids screaming sounds wonderful to me. 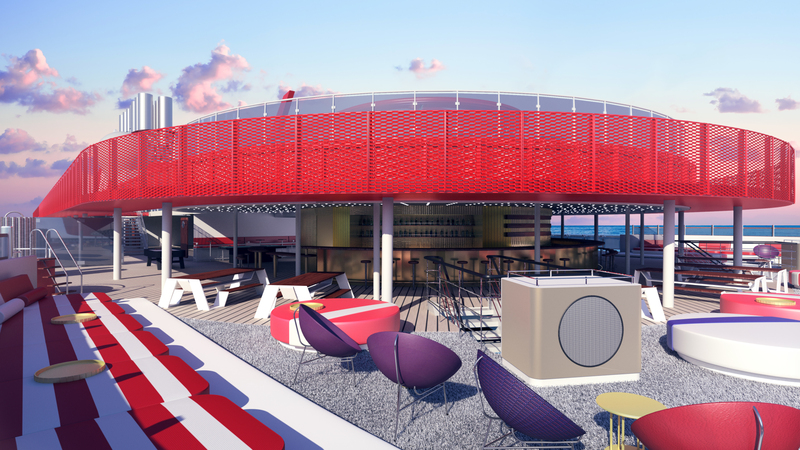 Virgin Voyages is definitely looking to change the face of cruising. Every deck will be like a serenity deck. What I’m not sure of is if this ship will cater more to the younger adult crowd, or if there will be a mix of ages. I’m an empty nester, and I don’t want to feel out of place. I think that time will tell on that one. The Scarlet Lady, a beautiful ship with the Virgin Mermaid on her side, will sail sometime in 2020 out of Miami and cruise to unnamed ports in the Caribbean. She’ll hold more than 2,700 passengers and 1,150 crew from around the world. The vision is a “Modern Romance of Sailing”. The top deck looks like a place that I’d love to sit and watch the ocean go by. It’s an outdoor lounge with sofas, umbrellas, and wicker swings, a totally peaceful and relaxing area. 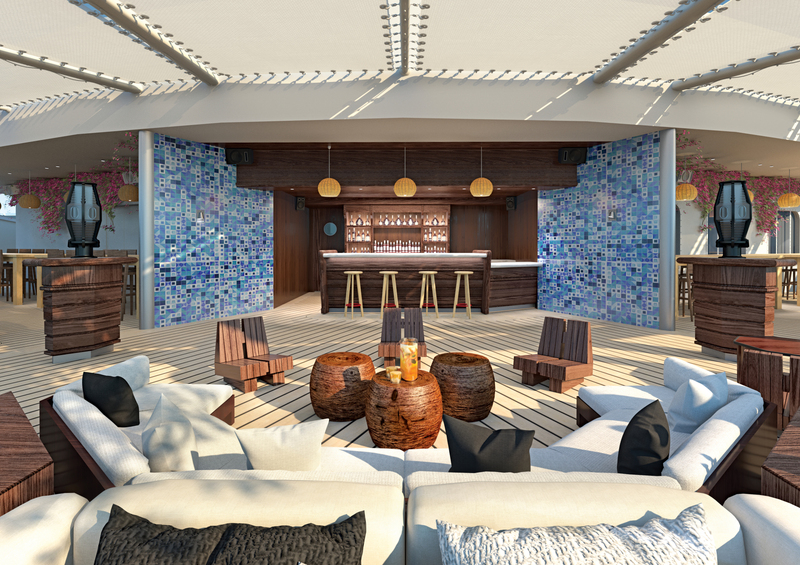 However, that wonderful deck will be reserved for the ship’s suite guests only. I’m quite disappointed since I had a wicker swing at my last house and loved it so much. 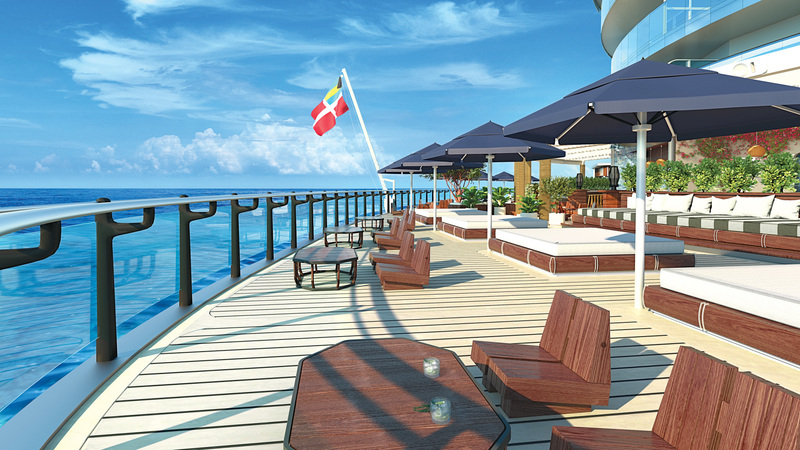 There’s also another outdoor lounge on the ship called The Dock which will be on deck 7 aft. 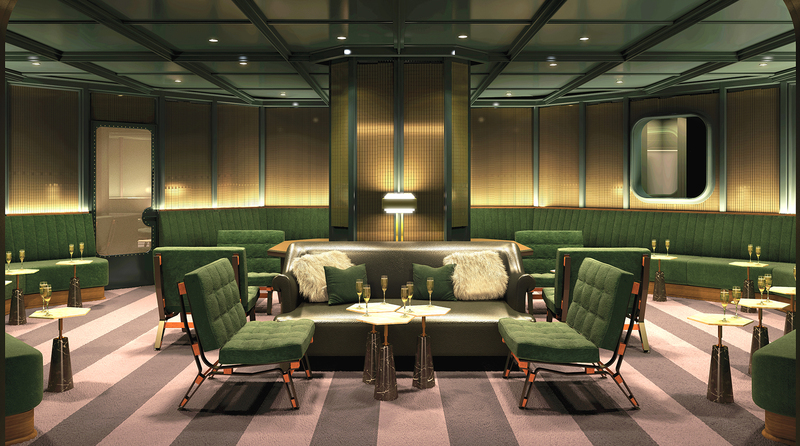 Another lounge will be called The Athletic Club, featuring the largest daybed at sea. 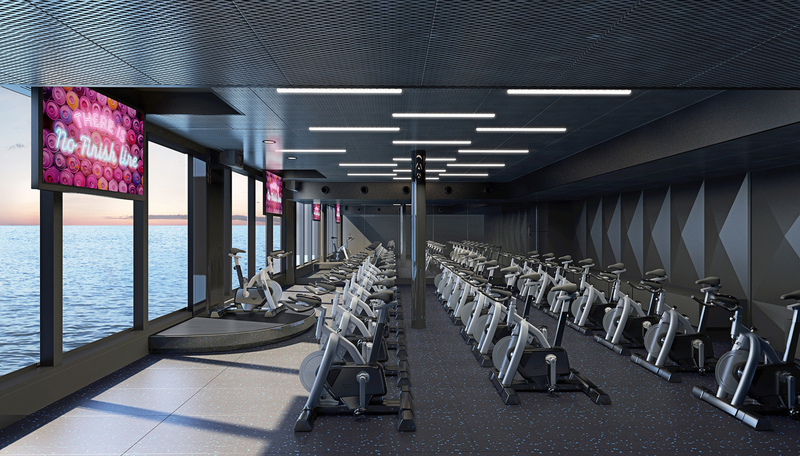 Another feature of The Athletic Club is something that I cannot picture on a ship…a 220 square foot area of triple catamaran style netting that you can lay on and look at the decks below. Wouldn’t it be fun if you could watch the ocean from it instead? Just as long as it didn’t tear and drop you in. 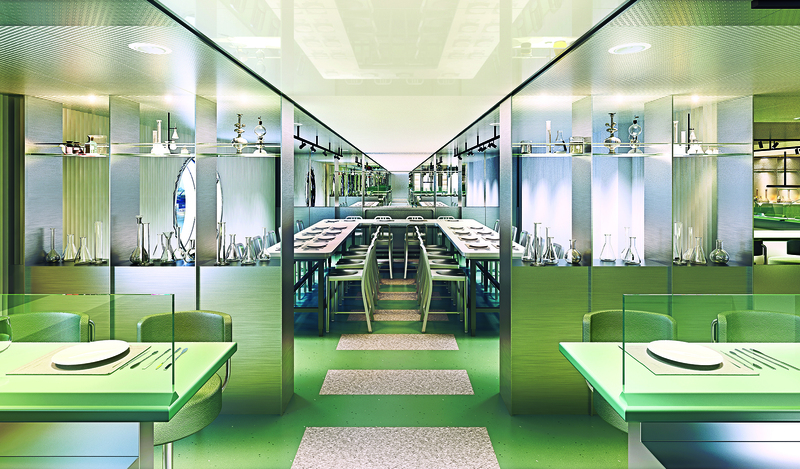 Restaurants will include a Mexican Restaurant and The Test Kitchen Restaurant, and there will be a nightclub called The Manor. It seems that the Scarlet Lady is going to be the most eco-friendly ship to date. No single-use plastics will be allowed, which includes plastic bottles, plastic straws, stirrers, condiment packs, to-go cups, and other necessary food packaging. I’m assuming that passengers, called “sailors” by Virgin Voyages, will not be permitted to bring their own drinks in plastic bottles onboard. Reusable drink bottles will be provided instead, and complimentary still and sparkling water will be provided throughout the ship. They will also be converting the heat from the ship’s engines into electricity to reduce carbon dioxide emissions, among other things. Stress will also be placed on health and rejuvenation. And of course, relaxation. 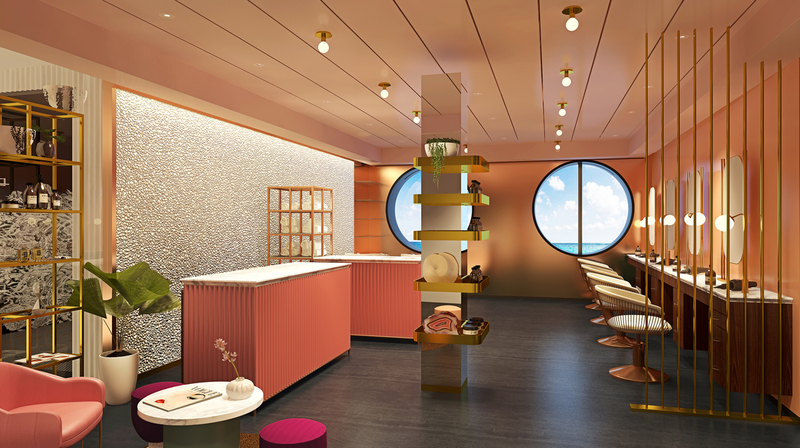 Their concept, known as “Vitamin Sea”, I think that’s kind of clever, wants you to leave your cruise feeling revived and refreshed and ready to face the world. The Crow’s Nest is meant for sunrise and sunset yoga. There’s a running track called The Runway. 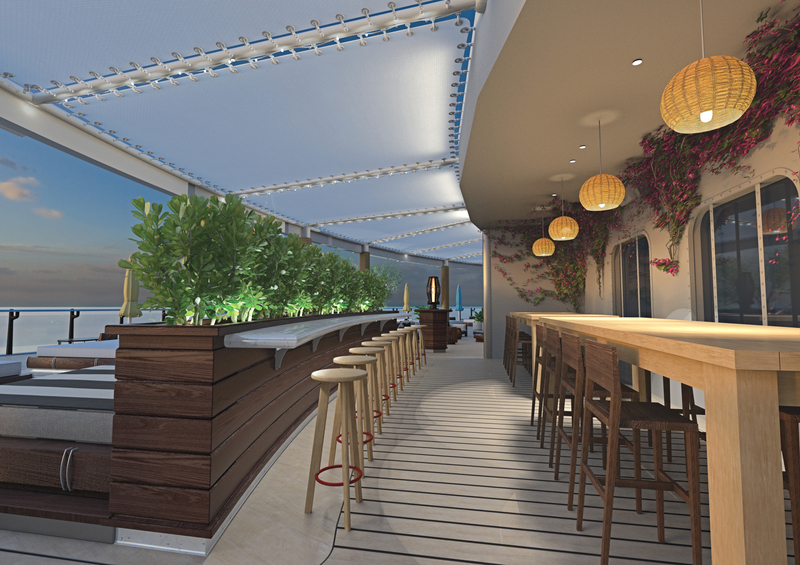 The Athletic Zone features a boxing ring, strength and gymnastics equipment, cabanas for relaxing, and a sports bar. The B-Complex, another clever name, has bikes, yoga, and cardio. Then you have the Well-being Pool, and the Gym and Tonic bar, which serves juices. 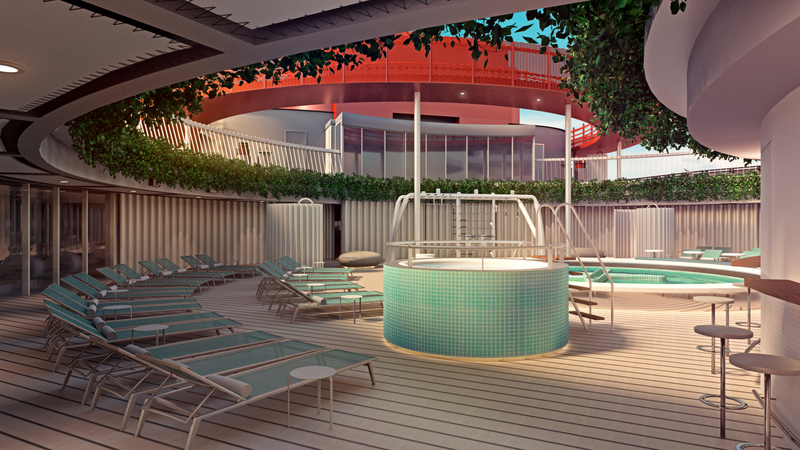 The Spa will be on deck 5 and have a hydrotherapy pool, mud room salt room, cold plunge pools, quartz beds, and spa treatments. And of course you’re going to have your room for a beauty parlor, barber, massages, and a mani-pedi area. Smoking is however allowed in designated areas, just like most ships. I could live without the smell of smoke permeating the decks of the ship near the casino. I’ve heard nothing about other areas of the ship. Don’t know if there’s a casino, and if there will be a buffet and a main dining room or just a lot of specialty dining. I’d imagine, seeing what else they’re emphasizing healthwise, that they’ll have healthy offerings in both the buffet and dining room. Ice cream on deck? Maybe lowfat. 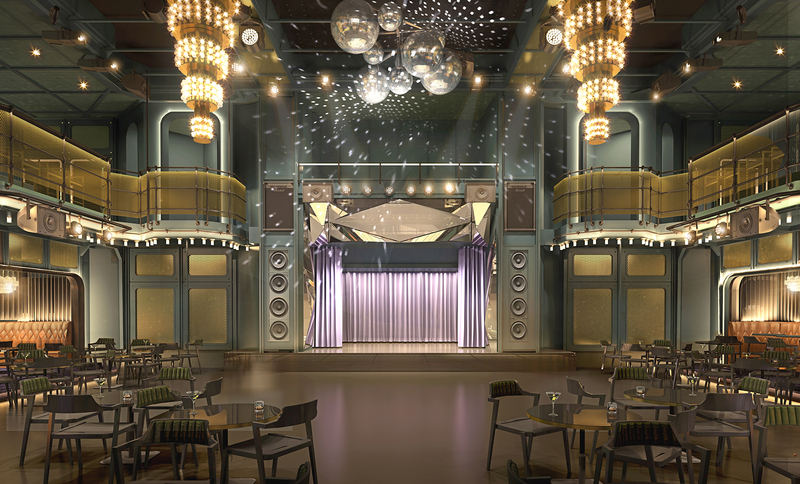 I wonder what the theater will look like, and if they’ll have comedy shows. Will there be ship photographers everywhere? How about internet service, although with Richard Branson I think it would be the best. So many things that have not been answered. Guess we’ll have to wait and see. I’ll definitely update you as I learn more. And the Scarlet Lady won’t be alone for long. Virgin’s second ship, which is still unnamed, has started construction already. It is due to be delivered in 2021. And there is another ship on order after that one. The shipbuilder is Fincantieri. I have no statistics on the ship yet, but if I get them, I’ll be sure to share them with you. I’m interested in the size of the cabins, and what they’ll look like. I’d imagine that there will be plenty of balcony rooms. At least I hope so. And in Virgin brands in the past, such as Virgin Mobile, prices have been more than competitive, so I’m hoping that trend continues with Virgin Voyages. 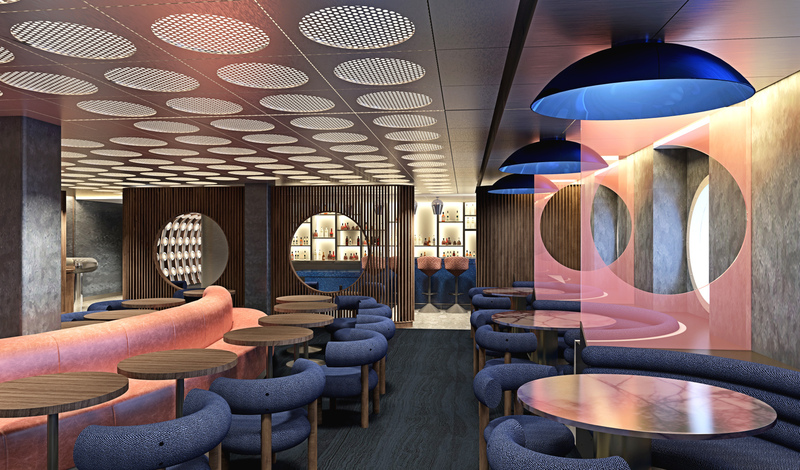 Check out the Virgin Voyages website here, and you can also follow them on Instagram, Facebook, Twitter, and LinkedIn @virginvoyages. Are you looking forward to the Scarlet Lady? Let me know below what you would like to see on the ship, and what you wouldn’t. How do you feel about it being adults only? And smoking or non-smoking? 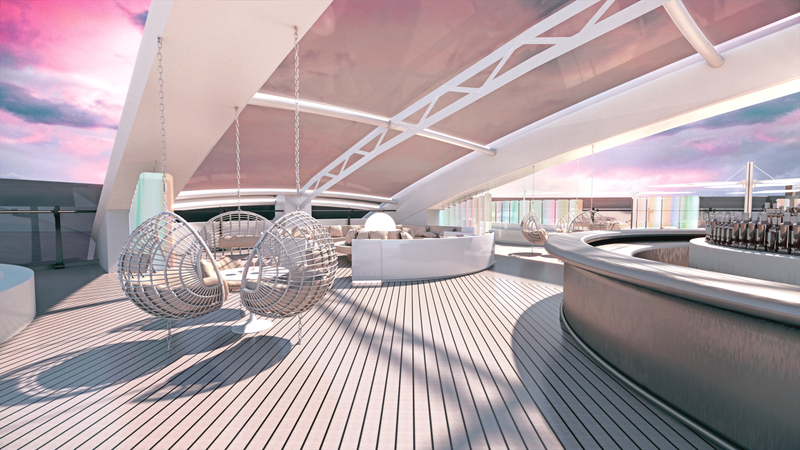 Check out more artist renderings below, courtesy of Virgin Voyages. Beautiful ship, right? Watch for updates as I get them. This entry was posted in virgin voyages and tagged cruise blog, cruiseblog, cruising, quietcruiser, scarlet lady, scarletlady, virgin voyages, virginvoyages on August 26, 2018 by The Quiet Cruiser.